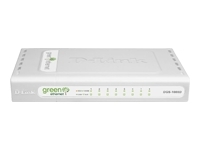 The DGS-1008D (Green Ethernet version) is an 8-port unmanaged Gigabit switch that consumes less energy than conventional switches of the same specification. The DGS-1008D (Green Ethernet version) reacts when a device attached to it is turned off, by placing the corresponding port in a standby mode that requires less power. In addition, the switch is able to detect the Ethernet cable length and adjust power usage accordingly, hence saving any surplus power that would otherwise dissipate as heat.